The holidays will be here before we know it and certainly your wallet will be feeling it! 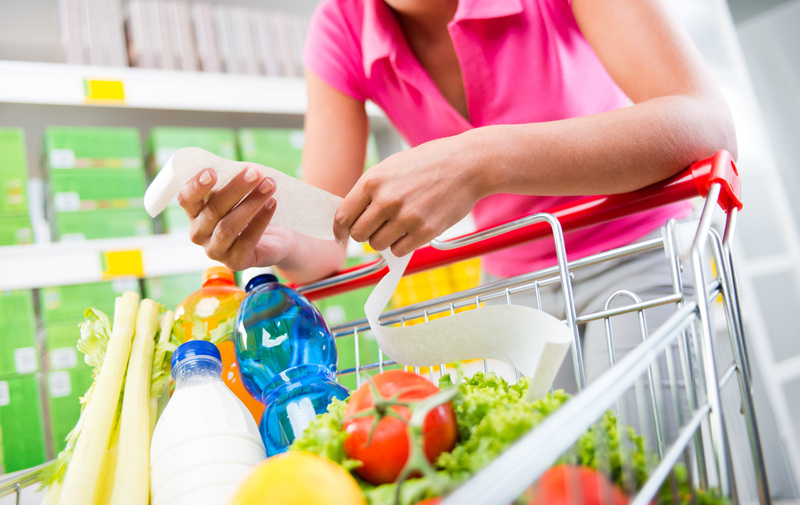 One place that you can work on tightening up your budget is by saving at the grocery store. With just a little bit of time and research, your grocery shopping expenses can really be cut drastically, while still making sure you are purchasing healthy foods. Save now, store for later – Freeze fresh whole grain bread/muffins/pitas to take advantage of sales or buy one/get one promotions. This guarantees you will have healthy ingredients in the kitchen for last minute meals. Shop the perimeter – Stay on the perimeter of the store for healthier foods and fresh ingredients that can save money by opting to make your own meals rather than buying pre-packaged ones from center aisles. Go the distance – Get the most out of your fruits by making homemade dry fruit for healthy snacks. Right before your fruit starts to go bad, try these tasty recipes for pineapple chips and fruit leather; both great for family fun! Cook a little extra – Save money by making a big batch of whole wheat pasta, like these healthy whole wheat pasta ideas, at the beginning of the week and then package in small containers to take for lunch. This will keep you from eating out and spending money at lunchtime! Select versatile foods – Consider purchasing foods that pair well for any meal of the day (like eggs and spinach) and then get creative with how you serve them in different breakfast, lunch and dinner entrees! Who says you can’t eat a healthy egg frittata for dinner? Buy what you need – Fresh seafood can be just as inexpensive as frozen. The key is buying only what you need. Since many grocery stores have a seafood counter, you can purchase the perfect amount of salmon or shrimp for your meal and avoid paying more for unused food. Do your homework – Check out the grocery store’s weekly circular and plan meals around the featured deals of the week or stock up on sale items and freeze for a later date. High-end grocery stores also typically have great daily deals, so make sure and look into those, too. Don’t forget to cut your coupons … small savings will add up! Make your own – In this case, make your own salad dressing. Why spend extra money when you likely already have ingredients in the kitchen? Check out these simple ways to make your own healthy salad dressing. Cook some chili – Chili is a great dinner option that also tastes great reheated for leftovers. Because the majority of the ingredients in chilis come from canned veggies, they offer a great way to save on weeknight meals. Here are some of our favorite chili recipes. Buy the whole thing – Choose the simplest versions of fruits and veggies. Instead of buying precut onions, carrots, potatoes, etc., opt for the whole versions. This way you aren’t paying for someone else to prepare food for you. Investing in some kitchen tools to prepare your fruits and veggies will not only save you money in the long run, but also makes for a fun family activity. Cook with same ingredients – Plan out a week’s menu using some of the same ingredients throughout your meals. This reduces your chances of wasting food and pushes you to get creative. For example, if buying a package of grape tomatoes, add half to whole wheat pasta, then chop up remaining and add to a pizzalad. Or, use a package of whole wheat wraps for the week to make quesadillas, breakfast wraps or as ‘bread’ for a sandwich. Use the scale – Spend a few extra minutes selecting the appropriate-sized fruits and veggies for your meals by using the store-provided scale. For example, a 1.5 lb. tomato may look smaller than a 1 lb. one, but choosing the lighter one will save money. Sub fruits and veggies for meat – When fresh fruits and veggies are in season, use in place of meats to save on costs. This will challenge you to try new things and be creative in the kitchen. Try some of these tasty berry healthy salad ideas. Look for clearance – See if your grocery store has a clearance section or manager’s specials for meals you are planning to make right away. This is a great way to save on meat and fish if you plan to use that day or soon after purchase. Shop wholesale – For more costly purchases, such as pine nuts or almonds, head over to your favorite wholesale store to get more for your money! What are your favorite ways to save at the grocery store? It’s the end of the month and we have some great budget saving tips for you on tomatoes and whole grains, the two September Foods of the Month! To recap, this month we created four different dishes – a whole grain pizza that could be a light meal or snack, a tomato salad, a hearty whole grain pasta dish for a family dinner or for a week’s worth of lunches, and a delicious egg and tomato sandwich that is a great weekend lunch idea. We were able to create these four meals for only $45. Scroll down for some money saving tips! Did you know that you can freeze fresh whole grains like whole grain bread, whole grain pitas and whole grain English muffins? Freezing these bread products is a great way to take advantage of a sale and buy one get one free promotions on healthy whole grains. Be sure to freeze the package before the expiration date. Then, the next time you want to make an whole grain pita pizza, or a whole wheat sandwich, defrost the bread in your microwave. After defrosting, we also like to toast our bread a little bit for sandwiches and pizzas for a fancier feel. Freezing is not only a good way to save money on whole grains, but it also guarantees that you will have healthy ingredients in your kitchen when you need to make a last minute meal!